On matchday 1 of the Pari-Match League, July 19, the Pitmen faced Oleksandriya. Ukrainian league 2015-16. Matchday 1. July 19, 2015. Lviv. Arena Lviv. Att: 2,634. 29C. The Pitmen’s home game with Oleksandriya took place at the Arena Lviv. The last time Shakhtar faced this team was in the 2011-12 season, the Pitmen claimed wins on both occasions, just like in the teams’ previous games. 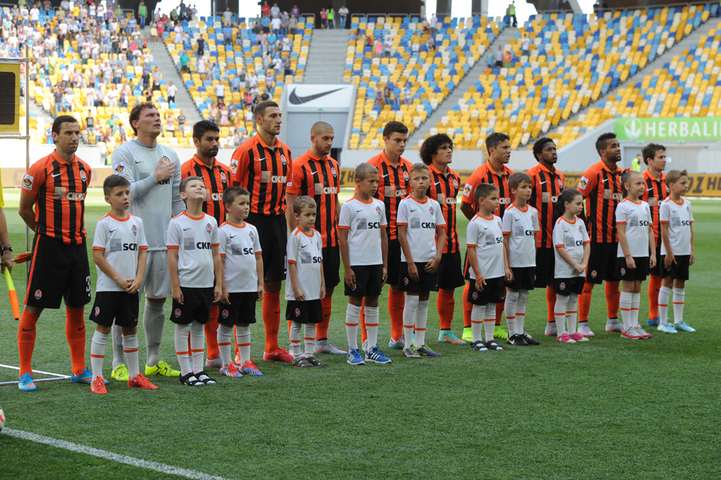 Taras Stepanenko and Taison were unable to take part in the game due to injuries. Mircea Lucescu fielded Maksym Malyshev in the holding midfield zone; Maksym played his debut match for Shakhtar in the Premier League. Besides, Eduardo started as centre forward, with Yaroslav Rakitskiy and Ivan Ordets playing at the heart of defence, with Azevedo operating at left back. The visitors started the game energetically, and as early as in the first minute Andriy Pyatov had to show his skills. Soon the Pitmen could have opened the scoring: Eduardo took a shot with a diving header, the goalkeeper made a save, and Marlos hit the crossbar after trying to seize on the rebound. After that Shakhtar took total control of the game, creating a number of scoring opportunities. The Pitmen netted a goal midway through the first half: Darijo Srna made a long pass to Alex Teixeira, who raced past two opponents before firing an unstoppable shot into the net to make it 1-0. The Pitmen were attacking, creating goal scoring opportunities. Srna had the best chance, but his curling shot from outside the penalty area was parried away by the opposition goalkeeper. Before the break, Oleksandriya again conceded a goal after an Ordets header, but the referee cancelled it, signaling Ivan for offside. A goal from the last season’s league top scorer Teixeira remained the only goal scored in the first half (1-0). Straight after the half time break Fred had an opportunity to score – his shot from close range flew just over the crossbar. Then Eduardo had a chance, but the opposition goalkeeper turned the ball away for a corner. Shakhtar dominated proceedings, completely depriving the opposition of the ball, with the Pitmen constantly joining attacking moves. Because of the heat, it was hard to keep the tempo, the referee suspended two times for players to drink some water. The Pitmen, who came on as subs, created another goal scoring opportunity. Viktor Kovalenko put Oleksandr Hladkyi through on goal, who sent the ball past the on-rushing goalkeeper but missed the target. Late on, Hladkyi flicked the ball on to Kovalenko who fired first time shot towards the near corner of the net, - the opposition goalkeeper again made a save. On 80 minutes, another save the visiting team led to a goal: Teixeira seized on the rebound to fire the ball into the roof of the net to make it 2-0. Therefore, Shakhtar beat the Premier League newcomers in a comfortable fashion, with Alex Teixeira, who sealed his brace, becoming the Man of the Match.